Manny Pacquiao always says his fight is for his country and most Filipinos see Manny Pacquiao as a hero or idol. The day where we all awaits whether who will then the next pound for pondking. Who will carry the honour of being the great boxer, or shall I say the one to beat Pacquiao..?.This will be Cotto's first fight in Las Vegas since his loss to Antonio Margarito in July of last year. It was the first time Cotto had lost a bout after 33 straight victories and while he landed some thundering shots to Margarito he also took his share of heavy blows. Pacquiao's trainer, Freddie Roach, the last honest man in boxing, says the only distraction he is focused on is Cotto's lethal left hook. Roach says he knows how to neutralize that, and Pacquiao will do so. He also says that, as in the De La Hoya fight, Pacquiao will not allow Cotto to get him on the ropes. "He has promised me, he'll fight this one in the center of the ring," Roach says. But unlike Pacquiao, Cotto will be seeing action in a high-profile Las Vegas bout for only the second time since figuring in a brutal affair against Antonio Margarito two years ago. That fight, also staged at the MGM Grand, saw Margarito beat Cotto to a pulp for a merciless 11th round technical-knockout victory. Puerto Rico is a boxing hotbed and Miguel Cotto is the current king of the island. Cotto follows in the footsteps of such Puerto Rican legends of the ring as Carlos Ortiz, Wilfredo Gomez, Hector Camacho, and Felix Trinidad. 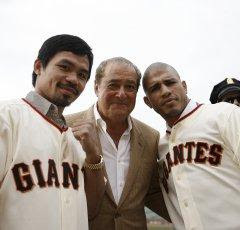 A win over Pacquiao would cement Cotto’s place next to these boxing luminaries. Pacquiao will attempt to raise the bar yet again when he faces Miguel Cotto. A win would give Pacman a world title in his seventh weight class. Pacquiao’s loyal fan base would love nothing more than to see their man make history. Miguel Cotto’s proud Puerto Rican following would love nothing more than to prevent it.